Blues winger Jaden Schwartz sustained a shoulder injury on Thursday during Canada’s quarterfinal victory over Russia at the World Championships, notes Jim Thomas of the St. Louis Post-Dispatch. The injury occurred during the third period of the game and he did not return. The injury will not require surgery but he will miss the final two games of the tournament which wraps up on Sunday. However, Armstrong noted that this is not believed to be a long-term issue and that he fully expects Schwartz to be ready in time for training camp in September. He’s far from the only St. Louis player that will be on the mend as defensemen Jay Bouwmeester (hip) and Carl Gunnarsson (knee) as well as wingers Robby Fabbri (knee) and Vladimir Tarasenko (shoulder) are all currently recovering from their respective surgeries. Jets winger Nikolaj Ehlers’ absence from the lineup in Game Three was not injury-related but rather due to an illness, reports Postmedia’s Ken Wiebe (Twitter link). While he hasn’t skated for the past three days, he is expected to be available and play tonight in Game Four against the Golden Knights. Retired Predators center Mike Fisher isn’t ruling out rejoining the Predators in some sort of non-playing role down the road, notes Adam Vingan of The Tennessean. Head coach Peter Laviolette stated that he has encouraged the veteran to think about coaching but that doesn’t appear to be something the 37-year-old is interested in at the moment while GM David Poile hinted that it could be a while before Fisher does decide on a new role. However, we know that he won’t be unretiring for another late season run as that is something Fisher ruled out following Nashville’s elimination from the playoffs. Nashville Predators forward Mike Fisher announced that he will be retiring from the NHL again, according to Predators’ communications coordinator Brooks Bratten. The veteran who retired last season after the Predators fell in the Stanley Cup Finals, returned to Nashville in January to take another shot at a cup run. However, after failing to get out of the second round of the playoffs after a seven-game series loss to the Winnipeg Jets, Fisher said he’s done. “This cow has been milked as much as it can. 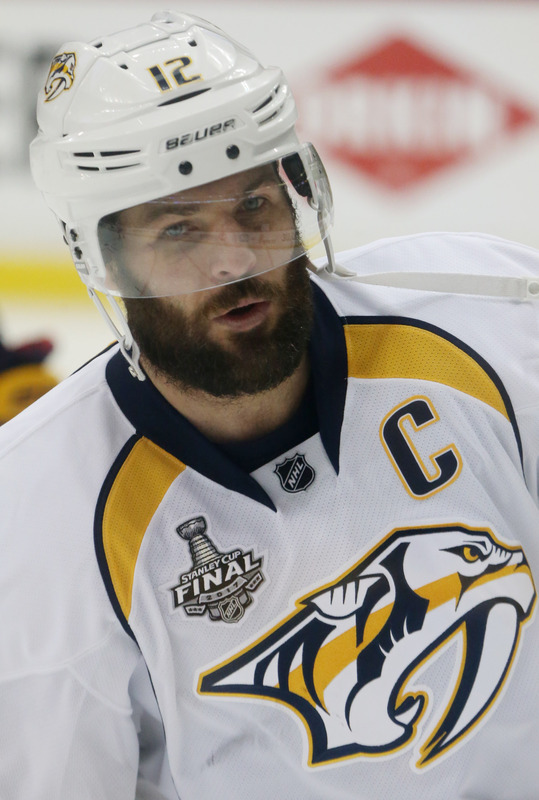 It’s bone dry,” said Fisher, according to Predators Radio Network’s Jeremy Gover. The 37-year-old Fisher played 18 seasons in the NHL, putting up a 278 goals, 311 assists and 589 points in 1,104 regular season games. He scored two goals and two assists in 16 games after coming out of retirement this year, but scored just one goal in 12 playoff games this year, playing mostly on the fourth line. Even if he hadn’t opted to retire, his future with the team was likely in doubt since the one-year, $1MM deal he signed on Feb. 26 will expire. The long-time Predator was in the middle of a team that is filled with young, quality forwards, which likely would have forced him out anyway. While his playing career is over, Fisher left the door open for a potential future role with the Predators organization. Following a strong showing after being acquired at the trade deadline, the Sharks intend to try to re-sign pending unrestricted free agent winger Evander Kane this offseason, reports Paul Gackle of the Bay Area News Group. For his part, Kane admitted that he would be open to returning but he isn’t ready to commit to anything just yet. That won’t stop GM Doug Wilson from trying to get something done in advance, however. He acknowledged that he intends to sit down with Kane and his agent “in the next little while”. San Jose has plenty of cap space to work with this summer so from a financial standpoint, they should be able to be among the high bidders for his services if they want. If the Sharks are able to re-sign him, the 2019 second-round pick they sent to Buffalo as part of the trade would instead become their 2019 first-rounder. Coyotes defenseman Kevin Connauton is set to become an unrestricted free agent in July and his agent, Matt Owens, told Arizona Sports’ Craig Morgan that playing time will go a long way in determining where he signs next. The 28-year-old posted a career high in goals with 11 this season but he still played a relatively sparing role, logging just over 15 minutes of ice time per game. Oates acknowledged that there have been no discussions regarding a contract and that he is leaving it to GM John Chayka to kick-start any possible negotiations. Nashville center Mike Fisher left Monday’s game due to an undisclosed injury and Thomas Willis of the Predators’ team website notes (Twitter link) that there is still no update as to the nature of the injury or how long he’ll be out. The veteran left after playing less than three minutes in total which forced the Preds to go with 11 forwards for most of the game. If he’s unable to return, one of Miikka Salomaki or Ryan Hartman will likely draw back into the lineup. The USA Today’s Jace Evans is one of many to write about Colorado netminder Andrew Hammond’s 44-save performance last night that kept the Avalanche alive for another day. Hammond was called into duty after Colorado goalie Jonathan Bernier was lost to injury after Game Four. Hammond burst onto the scene two seasons ago when he backstopped the Ottawa Senators to an unexpected playoff performance after going 20-1-2 in 24 games and boasting a .941 save percentage during that stretch. The Sens were bounced in the first round and Hammond couldn’t replicate that performance following 2014-15, leading to a demotion and eventual trade to Colorado as part of the Matt Duchene deal. Evans quotes the “Hamburglar” as saying you never know when you’re going to get a second chance, and with that bonus opportunity, Hammond turned a lot of heads. The Sporting News’ Brandon Schlager continues, calling it “perfect serendipity” for Hammond to rescue the Avalanche after falling down 3-1 to the defending Western Conference champion Nashville Predators. Schalger uses clips from the game intertwined with description to break down some of Hammond’s biggest saves in the game, and adds that the NHL playoffs are well known for “red-hot” goalies stealing games against teams that should otherwise win in convincing fashion. The Tennessean’s Mike Organ includes a few quotes from Nashville’s Mike Fisher, who thinks it’s as simple as putting the puck where Hammond isn’t in order to break through. While there doesn’t seem to be much worry on Nashville’s side, one has to wonder if the Hamburglar still has some games left to steal. For a litany of reasons, the Minnesota Wild are out of the first round for a third straight season. Chief among them: they didn’t show up for a crucial game five. CBS Sports’ Pete Blackburn cites the poor showing in the deciding game as a reason the Wild need to make serious changes this offseason. Teams are judged by their play when their backs are against the wall, and Blackburn charges the Wild as a squad that “produced a nice, wet, stinky turd.” In addition, the Jets relentless attack, some bad luck, and the strong play of Connor Hellebuyck doomed the Wild in the series. While they’ve hardly been eliminated from the playoffs, the St. Louis Blues are definitely having a disappointing season. With that in mind, the St. Louis Blues are likely to make some changes this offseason. The Athletic’s Jeremy Rutherford (subscription required) writes in a mailbag column that one change that shouldn’t happen is a coaching change. While the coach always must be held accountable for his actions, the scribe writes that it’s too early to push all the team’s failings on head coach Mike Yeo, who has only been with the team a little more than a year. Many of the leadership and chemistry issues that the team has were already there before Yeo got there. While Rutherford does admit it’s disturbing that Yeo’s last coaching stint with the Minnesota Wild had many of the same issues, Yeo deserves more time to right the ship, which might require some personnel changes on the ice as many players are not pulling their weight. One other issue is the team has struggled with key injuries to key players. The team failed to find an offensive replacement when Robby Fabbri or Jaden Schwartz were injured. In fact in 20 games without Schwartz, the team was 9-10-1. In the same piece, Rutherford writes that while many people would like the team to buyout players who are struggling in St. Louis like Patrik Berglund, Jake Allen and Alex Steen, that won’t happen this offseason. All of their contracts would be too expensive to buyout. Berglund’s buyout cost would be $9.7MM, Allen’s would be $9MM and Steen’s contract would cost them $10.6MM. The most likely buyout candidate might be defenseman Jay Bouwmeester, who would only cost the team $3.6MM and would count just $1.8MM against the cap for the next two years. The Edmonton Oilers announced they have activated center Ryan Nugent-Hopkins off of injured reserve Saturday. The 24-year-old has been out since Jan. 13 with a rib injury. While the former first overall pick will not be rejoining a team headed for the playoffs, he might bring up his own value with a good end of the season. Nugent-Hopkins could be a legitimate trade candidate this offseason. He was having a solid season in which he had 16 goals and 31 points in 46 games. With teams being desperate for centers and the Oilers having quite a few of them, they might find a taker for him. The Eeli Tolvanen countdown continues as the Nashville Predators are awaiting their top prospect after his KHL team wraps up their season. The Tennessean’s Adam Vingan writes that Tolvanen’s team, Jokerit, opened their first-round playoff series Saturday with a double-overtime loss. The earliest possible day for Jokerit to be eliminated would be this Wednesday. If so, Tolvanen could join Nashville for their remainder of the season and the playoffs if they feel he can contribute. Of course, the Predators are loaded with depth since the trade deadline after acquiring Ryan Hartman and signing Mike Fisher. Colorado Avalanche head coach Jared Bednar said that Vladislav Kamenev, who has been out with a broken arm since November after being injured in his first game for the Avalanche, has been cleared and might be assigned to the San Antonio Rampage of the AHL in the next couple of days for a conditioning assignment, according to Denver Post’s Mike Chambers. Kamenev, who was acquired on Nov. 6 in the three-team trade between Colorado, Ottawa and Nashville involving Kyle Turris and Matt Duchene, was injured while playing in his first game with Colorado. A key prospect included in the Avalanche’s haul for moving Duchene, Kamenev has played just 14 AHL games this year, having totaled three goals and nine assists. His return is just another talented player ready to step into the Avalanche’s lineup. Chambers also mentioned in the same tweet that goalie Jonathan Bernier has also been cleared after suffering a concussion on Feb. 16. The Avalanche added that he was a full participant in practice Saturday and is expected to be activated soon. 2/26: The Predators have officially announced the signing. 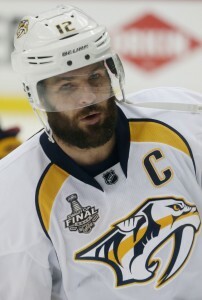 2/25: TSN’s Pierre LeBrun reports that the Predators will announce a one-year, $1MM deal with Fisher tomorrow. The pro-rated deal will only cost Nashville around $225K to bring back their former captain for one last run at the Stanley Cup. Fisher has been working out with the team since the initial report last month and no doubt will be ready to go when he gets his first chance to again take the ice. 1/31: In probably the most surprising turn of the season, Mike Fisher is set to come out of retirement and sign with the Nashville Predators for the remainder of the season. Fisher hung up his skates in August after deliberating for much of the offseason, calling it the “hardest decision” he’d ever had to make. The 37-year old center captained the Predators all the way to the Stanley Cup Finals last season, after a successful regular season which saw him record 18 goals and 42 points. The Predators have brought in both Nick Bonino and Kyle Turris since then to try and fill out their center depth, and adding Fisher now will make them an impressive group. Just recently, Predators’ GM David Poile admitted to Pierre LeBrun of The Athletic that he would like to make an addition up front, though a big splash didn’t seem likely. With Fisher back in the fold, the Nashville forward group can be matched up with anyone in the league, at least when healthy. There is no exact timeline yet on when Fisher will be ready for game action, but his contract must be signed and added to the roster before the February 26th deadline in order to be eligible for the playoffs. Depending on how well he’s kept himself in shape since retiring, it could be even sooner than that. No financial details have been released yet, but the contract is expected to only be for the rest of 2017-18. The Carolina Hurricanes were one of the few NHL teams in action yesterday, but weren’t able to put up much of a fight against the San Jose Sharks, losing 3-1. After the game, head coach Bill Peters had a lot to say about the effort of his team, and Luke DeCock of the News & Observer encapsulated the comments in a scathing review of the club. Whether Peters’ angry exclamation that the Hurricanes “can’t put that group out again after that” will actually spark some movement from GM Ron Francis is unclear, but the team certainly isn’t satisfied with how they’ve played. Carolina has lost two in a row but still find themselves only one point out of a wildcard spot in the Eastern Conference. If there was ever a time to push some chips to the middle and try for a playoff push, now might be it. The Nashville Predators are one of the deepest teams in the NHL, and will only improve in that regard when Mike Fisher returns to the lineup at some point over the next few weeks. Still, that isn’t stopping GM David Poile from looking around for another forward. Adam Vingan of the Tennessean reports that Poile could still go after a top-six winger, and points out that the Predators have a ton of cap room to fit in even the most expensive players. Though his short NHL stints haven’t gone perfectly, Dylan Strome continues to impress in the minor leagues. The 20-year old Arizona Coyotes forward is leading the league in points-per-game with 41 in 32 games, and will look to continue that dominance tonight against the San Jose Barracuda. Strome, the third-overall pick from 2015, has just two points in 18 NHL contests but is still a big part of the Coyotes future plans. If Max Domi truly is on the block in the desert, Arizona will need Strome to take the next step before long and help fill some of the offensive burden that Domi has struggled with at times this season. The Nashville Predators keep finding themselves in the news. After announcing that former captain Mike Fisher was coming out of retirement and would sign in the coming weeks with the team, the Predators have now acquired another center via trade, albeit a minor one, as they have traded minor league defenseman Andrew O’Brien to the Dallas Stars in exchange for center Mark McNeill, according to the Dallas Stars. Obviously added as a depth forward for the AHL’s Milwaukee Admirals, McNeill was once considered a top prospect of the Chicago Blackhawks after being drafted in the first round of the 2011 draft. Considered a strong possibility to make the proud franchise immediately after he was drafted, he didn’t make the team and found himself languishing in the AHL for years, never getting an opportunity to show what he could do in the NHL. He only played one game with Chicago before the Blackhawks moved him at the trade last year to Dallas in exchange for defenseman Johnny Oduya. He did make one appearance last year in Dallas, but spent most of the last year and all of this year with the Texas Stars. He is considered to have shooting ability, solid speed and good defensive skills, but has always struggled with consistency. He has played in 312 games in his AHL career so far. This year, the 24-year-old has played just 18 for the Texas Stars and has five goals and an assist. As for O’Brien, the 24-year-old defenseman has also played many years in the AHL, never having been promoted to the NHL. The blueliner has played 188 career AHL games, but in just 21 games this season. He has put up three assists and 27 penalty minutes with the Milwaukee Admirals. He will report to the Texas Stars.